Frenchville Sports Club would like to welcome one of Australia’s most successful Elvis Tribute acts. 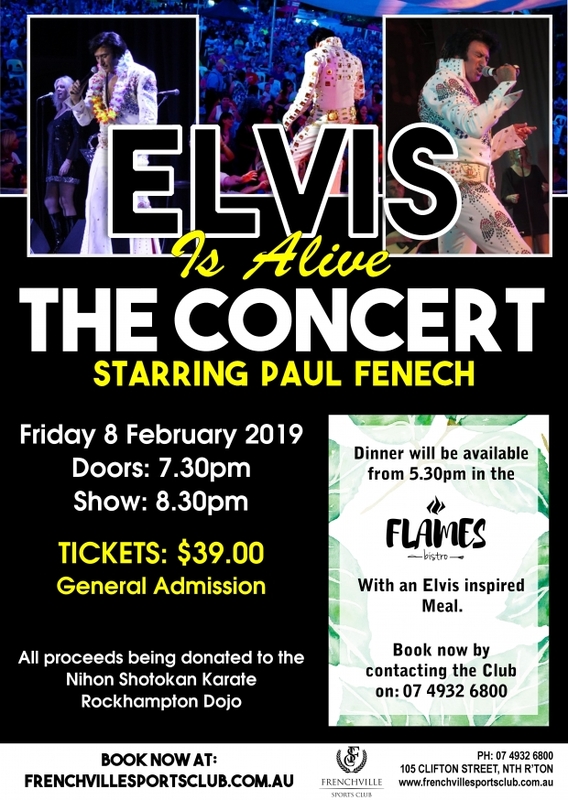 ELVIS IS ALIVE THE CONCERT starring Paul Fenech. Paul Fenech is one of Australia’s most experienced Elvis Tribute performers and one of the world’s most successful, with over 19 years of international and domestic experience including regular performances in Memphis, New Zealand and Asia. He is the Only ‘Elvis’ to perform to over 80000 fun runners at the annual ‘City to Surf’ and as quoted by the city of Sydney, “It would’nt be the same without him”.